We had Spaghetti Bolognese on Monday and I made enough so that I could make Lasagne last night!! Bolognese is my all-time favourite dish, ever since I was a kid I couldn’t get enough of it. Even though I love most foods this comforting dish is just the BEST!!! I then add crispy bacon, mozzarella cheese sauce, extra mozzarella and red cheddar on top. It’s nice to use the red cheese for colour and taste. 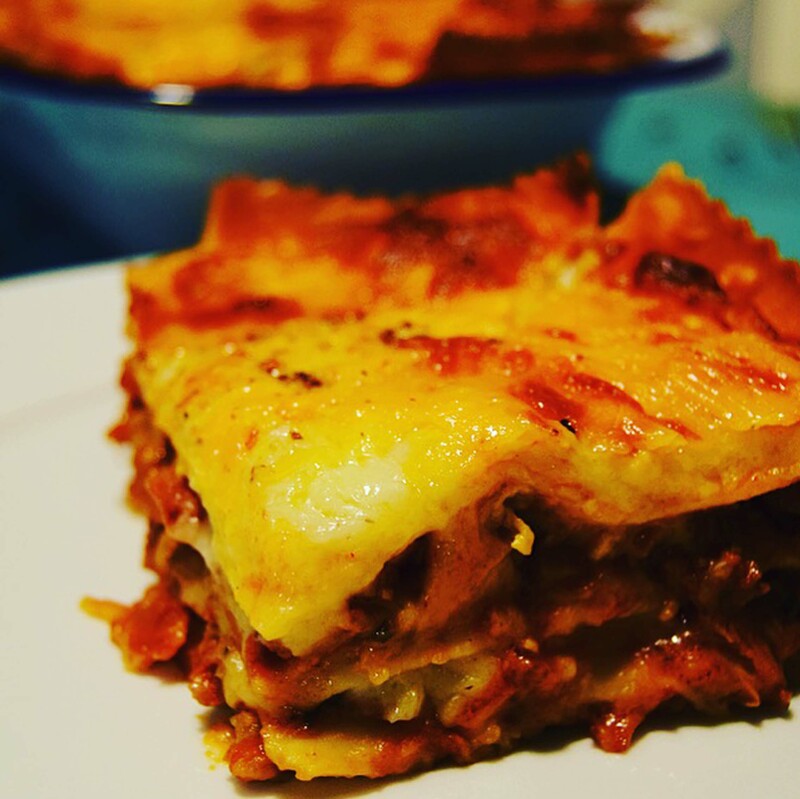 I lay the pasta sheets out so it holds the layers inside like a pie, that way it can be cut up easier and also the edges become crunchy and crispy whilst the inside oozes with cheese and sauce. Have everything grated and prepared and measured. Cook the bacon, you can fry this but I prefer to grill it. Cook until crispy then place onto kitchen paper to remove the extra oils then crumble into a bowl and set aside. If using leftovers reheat the Bolognese on low, adding any extra tomatoes or liquids. I added some fresh grated tomatoes and a little water. To make the cheese sauce, melt the butter in a saucepan, once melted stir in the flour and cook for a few minutes stirring as you go. Then whisk in the milk a little at a time, I usually make a roux with a little milk whisk to make it smooth then pour in the extra milk. Keep the heat on med-high and keep whisking, the sauce should start to thicken. Once it is like a double cream add halve of the mozzarella cheese, black pepper and the nutmeg. Turn the heat off as you do not want this to be too thick. Set aside. Grease the oven dish you are using well so the pasta does not stick. Then lay the sheet over the bottom they can slightly overlap. Then place the sheets around the sides, you can cut these if you need to. Then sprinkle over some bacon. Carry on for 2 more layers starting with the pasta sheets. It might take you 1 more layer depending on the amount of sauce you have and the size of your dish. But what you want is to get close to the top of the dish, leaving about 0.5cm. The top layer is just the pasta then the cheese sauce, any extra bacon you have left and the grated leftover cheeses. Season with cracked black pepper and drizzle with a little olive oil. I also rubbed a little butter on the top edges of the pasta sheets that were not touching the sauce, you do not want these to burn. Place in the oven for 40-45 minutes, until the cheese is melted and bubbling and the edges are browned. Now spoon in the bolognaise, just enough to cover the base, the pour over a layer of the cheese sauce, then sprinkle in some bacon. Carry on for 2 more layers, or more depending on the amount of sauce you have and the size of your dish. But what you want is to get close to the top but not fully.